What does Home Health Care Cost in Pennsylvania? 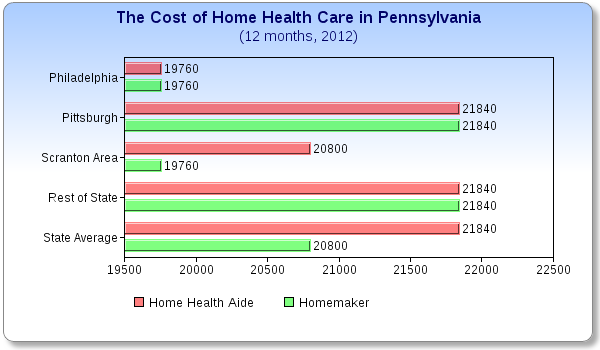 If you or a family member needs home health care, and you live in Pennsylvania, plan on it costing about $21 per hour. That's the average cost in the state for a Health Aide, according to a survey published by the MetLife Mature Market Institute*. The yearly cost of $21,840 is based on an estimate of 4 hours per day, 5 days per week. In Philadelphia for example, the average cost of a Health Aide was $19 per hour. In Pittsburgh it was $21. In the rest of the state, it was $21 per hour. The rates for a Health Aide ranged from a low of $14 to a high of $30. The 2012 average was one dollar above the 2011 average of $20 per hour. Homemaker aides usually cost less than health aides. The average cost in 2012 for a homemaker was $20 per hour. The range of rates reported was $14 to $30. The average rate in 2011 was reported as $19 per hour. Pennsylvania, Nevada, Maryland, Maine, Illinois, Washington D.C. and Arizona are all tied as the 19th highest for the cost for Home Health Care in the United States. New Jersey ranked just above, and New Mexico ranked next lower, The United States average cost for a Health Aide was $21 per hour. A Homemaker Aide was $20. For comparison, the average daily cost for a private room in a nursing home in Pennsylvania was $290 ($105,850 annually). The monthly private-pay base rate in an assisted living facility with one-bedroom apartments or private rooms with private baths was $3,503 per month ($42,036 for 12 months). The average cost of Adult Day Services (Adult Day Care) was $60 per day ($21,900 for 365 days).